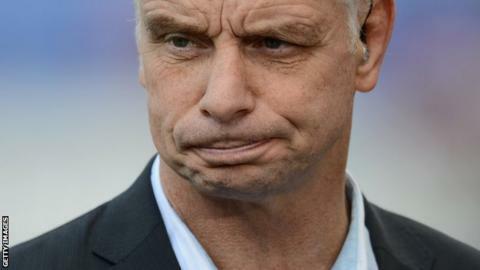 Brian Noble has admitted that it was a shock to be informed he was being replaced as head coach of Salford. The 53-year-old, who has been offered an alternative role as director of football, will be succeeded by former Wigan assistant Iestyn Harris. Noble was told by owner Marwan Koukash shortly after the Red Devils reached the fifth round of the Challenge Cup. "After the great win on Thursday night at Hull, it was a bit of a surprise to say the least," he told BBC Sport. "I met Marwan on Friday morning and he was very keen to go in a different direction on the coaching front. That's, in a nutshell, where we're at. "There has been a job offer as a director of football and the intricacies of that have not been discussed in detail." Noble took charge of Salford in April 2013 and could not prevent the club finishing bottom of Super League last season. The Red Devils, who made a host of new signings during the winter, are currently ninth in the table with three wins from seven matches. Harris, who is also coach of Wales, worked alongside Noble at Crusaders and Noble is hopeful the 37-year-old will do well. "Iestyn is taking over [on Monday] in relation to the coaching aspects of the club and I wish him absolutely every success," he added. "I think this team is really ready to take off and do things. Am I disappointed? Absolutely. Do I understand some of it? Maybe not. But that's a good group of players and it just takes time sometimes to gel people. "I know intimately what's gone on and I know intimately where the team is. I absolutely have the complete faith in that team that they will go on and do things."